Sometimes it is obvious where the world is headed, but some people and industries become frozen in place and time. They are like the duckbilled dinosaurs happily munching on the still-abundant plants around them when the meteor strikes instead of the small furry mammals underfoot who take cover every day by natural habit. In the print newspaper industry, it’s the same story. Everyone wants to wall off the Web and keep grazing on declining ad revenues. A week ago, I wrote a post based on a conversation I had with Silicon Valley entrepreneur and investor Marc Andreessen in which he made the case that print media companies would be better off shutting down their print operations now (“Burn the boats”) and move forward unencumbered into the digital age, no matter how painful that may be. That suggestion hit a deep nerve, and continues to do so. Print-driven newspaper revenues still are running at better than $30 billion a year. It doesn’t take a certifiable Silicon Valley genius to see that no business can walk away from some 90% of its revenue base without imploding. Mutter’s indignation is typical of the response to the article, even among enlightened newsosaurs. But that is exactly what Andreessen is saying. As I noted in my original post, he is quite aware that “at risk is 80% of revenues and headcount” (or 90%, if you take Mutter’s numbers). Yes, the Internet media business is much less lucrative than the print side, and may never replace it in terms of the revenues it generates. But Andreessen’s point is that the meteor is on its way and the sooner that media companies start looking for cover, the more likely they are to survive. He is not trying to be an alarmist. He’s just a realist. In the technology industry, similar disruptions happen all the time. The companies that survive are the ones that adapt and jump onto the next wave of technology before the one they are on finishes cresting. So the real question is one of timing. How long will it take that $30 billion print business to go to $20 billion, $10 billion, or zero? No doubt, it will take years, probably decades. But how long do print media companies wait before they leave their old business behind? The people who read print newspapers and magazines are getting older and older, while advertisers always chase the young and impressionable. That audience is already on the Web. And they are no longer satisfied with getting all of their news from one or two trusted sources. They get their news from all over the place: newspaper sites, TV news sites, blogs, Twitter, Facebook. More and more, the news is coming to them through their friends and the various streams they consume. The old days of cross-subsidizing political news with ads from the Travel and Auto sections are over. The longer media companies wait, the bigger disadvantage they will have when they cross over to the other side and find a whole new host of competitors who never had any print legacy businesses to protect. Those competitors right now are blogs and online news hubs who are still furry little rodents in the underbrush, but who won’t stay little forever. The sooner print media companies cross over, the sooner they can be on pure offense. Their online strategies and business models won’t be crippled by any allegiance, or need to protect, to the old print business. If they wait until their online revenues become 25 or 50 percent before they fully commit, it will be too late. But that is probably what will happen. Media companies are still surrounded by $30 billion worth of leaves that look mighty good. 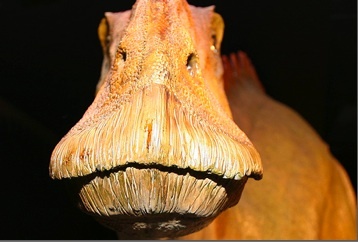 Photo of duckbilled dinosaur fossil by Ed Schipul .